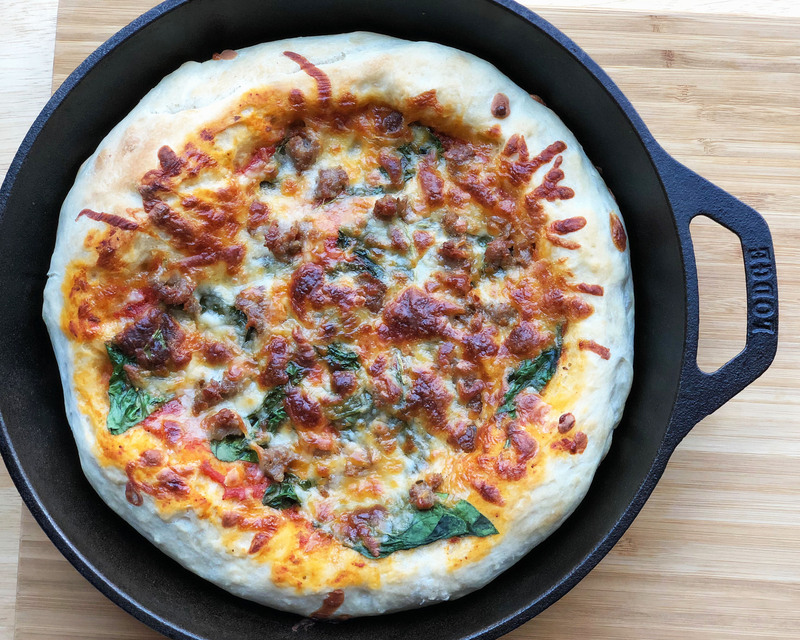 If you love the cheesy, saucy goodness of a good slice of pizza, there’s nothing more delicious than this homemade sausage and spinach pizza you can make easily in your skillet. Complete with a brown, crispy crust, this simple dish is sure to satisfy. 1. Preheat your oven to 475°F. Begin by cooking your sausage in a medium skillet over medium-high heat with olive oil until well-browned, firm and cooked through. Stir occasionally and break sausage into small pieces while it cooks. Drain and set aside. 2. Whisk together tomato sauce, tomato paste, two tablespoons parmesan, oregano, crushed red pepper and basil in a small bowl. 3. Meanwhile, heat the spinach by placing in a microwave-safe bowl with two tablespoons of water and microwave for 30 seconds, then in intervals of 10 seconds each until the leaves just begin to wilt. Transfer spinach to a colander and drain out the excess liquid, pressing leaves if necessary. 4. Choose a large cast-iron skillet and brush it with oil to prepare for the pizza. Set aside while you make the dough. On a floured surface, roll your pizza dough to about a 14-in. circle, place in greased skillet and roll edges inward to form a rim or crust. Brush your dough with olive oil and spread with tomato sauce, spinach and sausage. Sprinkle with mozzarella and remaining parmesan cheese. 5. Cook your skillet on the stove over medium-high for three minutes, then transfer to preheated oven and bake for 15 to 20 minutes until the crust and cheese are light, golden brown. Let stand for five minutes until cooled, then slide out onto a cutting board and use a pizza cutter to slice your pie. Yum! Loving the addition of our Sweet Italian Sausage on your skillet pizza? 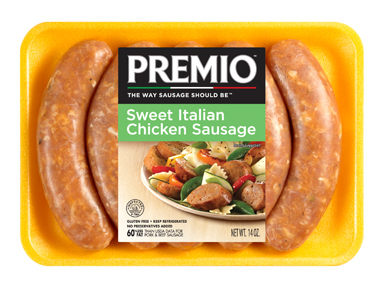 Try all our sausage varieties today when you search for Premio sausage in a store near you.